The gateway supports the UCP/EMI (Universal Computer Protocol / External Machine Interface) protocol, version 3.5 or higher, to connect to an SMSC over the internet or other private TCP/IP network. Some mobile operators provide UCP connections for higher volumes of SMS traffic. To add a UCP/EMI connection, select “Add” from the “SMSC” configuration dialog. Then select “UCP/EMI over TCP/IP“. “Server Host Name” specifies the TCP/IP address or host name of the UCP/EMI server. “Server Port” specifies the TCP/IP port on the UCP/EMI server to which the gateway should connect. “User Name” specifies the user name for the gateway to use when connecting to the UCP/EMI server. “Password” specifies the password for the gateway to use when connecting to the UCP/EMI server. Note: Some UCP/EMI systems may not require a username and password, and validate your account based only on the TCP/IP address of your system. If the username and password fields are left blank, the gateway will not send a UCP-60 bind message to the server to login. “Local Port”, if set, should be set to the value of a TCP/IP port number on the gateway PC. If set, the gateway will initiate all connections to the UCP/EMI server from this port. “Sender Address” specifies the default sender address (phone number) to apply to outbound SMS messages. The UCP/EMI server may override this setting. Check “Allow Sender Address Override” if you want to allow messages submitted to the gateway to be able to specify a sender address. If this box is checked, and a sender address is present in a message being submitted to an UCP/EMI based SMSC, the sender address in the message will be submitted to the SMSC. The UCP/EMI server may override this setting. 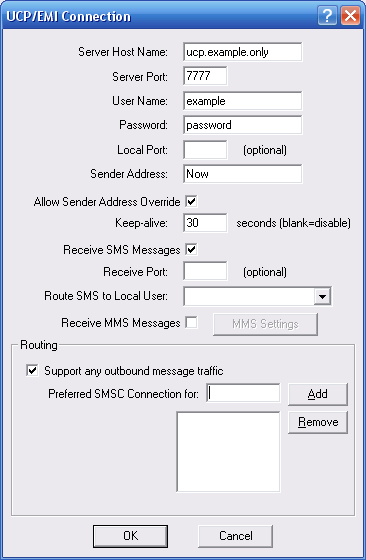 It is possible to configure NowSMS to route all SMS messages received via this SMSC connection to a user account on the NowSMS server by selecting the user account in the “Route SMS to local user” setting. It is possible for a user to connect to the NowSMS server either using SMPP (an SMS specific protocol) or POP3 (an e-mail protocol). These user accounts are defined on the “SMS Users” page of the NowSMS configuration dialog. Check the “Receive MMS Messages” box if you will be receiving MMS Notification messages via the SMSC. Note that most service providers do not support the routing of MMS notification messages via an SMSC connection. If MMS messages will be received via the SMSC connection, it is necessary to also configure additional MMS settings. The “MMS Settings” dialog will display a dialog with additional configuration settings that are required for enabling the gateway to be able to receive MMS messages from the operator network. For additional configuration information, please refer to Connecting to an Operator MMSC – Using a GPRS Modem. For additional configuration information on processing received MMS messages, please refer to 2-Way MMS Support. The “Routing” group of options is used when multiple SMSC connections are defined to the gateway. These options define what messages should be routed to this connection. The Routing options are common to SMPP, GSM Modem, UCP/EMI and HTTP connections, and are described in the Routing Options section. When the “OK” button is selected, the gateway will attempt to connect to the UCP/EMI server to verify the configuration information provided. Diagnostic information will be displayed if the connection fails. The connection will only be added to the configuration after a successful connection to the UCP/EMI server.